The preferred English method is one leg at a time, say every ten years, each leg elastically stretched backwards over the head for as long as possible, just to make sure. 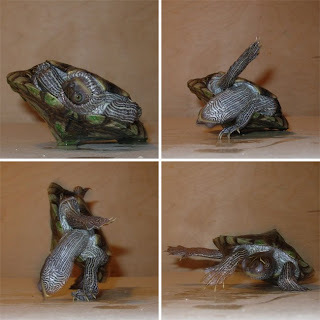 Actually, it’s agony, but it’s kindly intended to reassure those parts of the turtle that never wanted to turn in the first place that nothing’s really changed. Intellectually, it’s one way to express notional fairness to both sides. beats the heart of a young dancer. kicking up her heels at the Carnival ball. 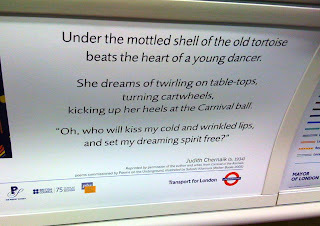 I remember poems on the underground! I was working in Parliament in the mid-1980s. It was an interesting feature, coming as it did in the midst of the Thatcher era there. St Joseph the Worker is on the 1st of May (easy to remember). The 19th is St Joseph, Spouse of the Blessed Virgin Mary. Thanks to all — Not being RC I don't of course Joseph the worker on 1 May, but follow ancient practice of celebrating SS Philip and James that day. On a kindred topic, I wonder how long it will take Apple Computer to claim St Joseph of Cupertino as their patron?